This is quite something right? Passion… It’s just beautiful… So what’s the deal with happiness? You know that moment when your talking with someone and their eyes are glowing with FIRE. You envy that! 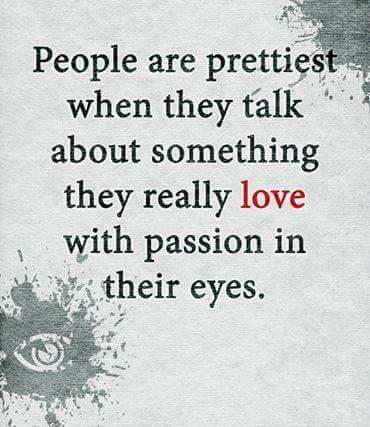 I know it’s happened to me many times when I speak about my Charity and Humanitarian work… My Eyes Glow! I feel invincible and that I can do Anything! That’s Passion! That’s Love! That’s Happiness! What’s yours? What makes you Glow?What makes you Fire Up? Find out… if you don’t already… Because fact is. THIS IS YOUR HAPPINESS! Without a Passion … You can’t be yourself because by Finding your Passion.. You find your Happiness…. and in being Happy .. You are your best YOU! So Find Yourself and see how Your Life Changes! I can’t stop talking about Passion because I have a passion for this type of happiness! I really do Love how my passion makes me feel. When I think of My passions.. Dance. Charity. Painting. I want to Fly! So I can’t stress enough… Seek it! Don’t settle without it. It will change your whole life! When someone tells you… You need to be happy Alone before you can be happy with someone else. You need to love yourself before you can love someone else. THIS IS IT! HAPPINESS COMES FROM WITHIN… PASSION IS WITHIN… FIND YOURSELF! LIFE IS SHORT. WHY NOT MAKE THE BEST OF IT. Limitations? Embrace life to the fullest! Amy Purdy is a professional snowboarder who despite losing both her legs at age 19, never gave up her dreams. This video is to show everyone that no matter what uncontrollable havocs occur within your lives, nothing should change what you dream to do or be. Limits are there to guide you, not to give up. This comes to show that no one should limit themselves to what they WANT because of an illness, an injury, or a general problem. As I mentioned in my first blog, my friend’s mother was diagnosed with cancer and was given 2 weeks to live. Though all the doctors were telling her to stay relaxed and rested… She had a mind of her own. 8 months later, she was still alive. It was not until 2 days ago that she passed away in her sleep. She never gave up, she went dancing, eating, and having the time of her life with her family. She never took no for an answer and lived every moment with as little limits that she can afford due to her lack of good health. She was a warrior and fought her way to live. She was given 2 weeks and survived 8 month. Some may call it miracle, others may call it heart. This is to show that one should never give up and ALWAYS FIGHT for what matters! The following video, touching, will bring forth a different perspective to your life and hopefully will change the way you see yourself and your life. Amy is an inspiring role model to many, and she her words should inspired many to live for what is worth living.